Chef shoes that get to the finish line. For chefs, bakers, and back of house workers, the last thing they want is a shoe that starts hurting when the day is half done. They need a shoe to carry them through to the finish line each day, keep them safe on slippery surfaces, provide proper foot support, and be easy to clean. 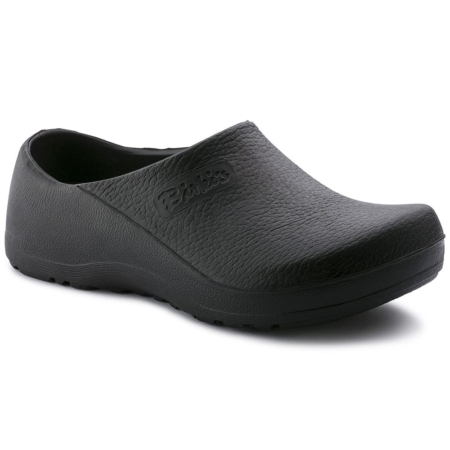 Aprons and Smocks brings you top quality chef clogs and shoes. We offer 2 select styles from Birkenstock: Profi-Birki Clogs and Alpro Birkenstock Chef Shoes —both with the renowned Birki footbed. Supports the foot’s natural arch. The qualities in the Birki footbed mean that by the end of your day, your chef’s feet and spine feel better than they would in a regular shoe. And the fit of the shoes actually improves the more they’re worn. Let’s face it, the floor in a kitchen can have lots of stuff on it—water, liquids, grease—liquids that are easy to slip on. 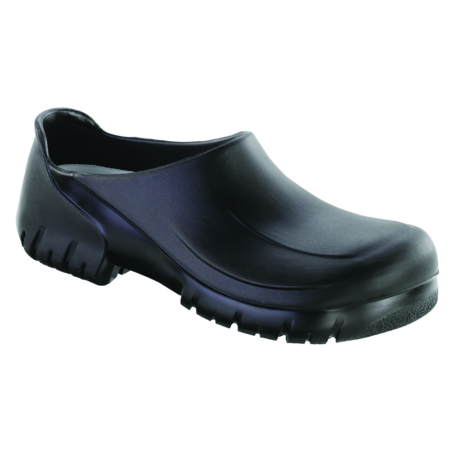 The Birkenstock shoe is highly recommended for restaurant kitchen chefs, cooks, kitchen workers, and servers who are in an environment with wet, damp or slippery floors. The Birkenstock shoe has a safety tested, certified slip resistant tread that grips. It’s made of a polyurethane surface which is tough, waterproof, and resistant to damage from heat, oil, grease, petrol, acids and alkaline. Apron’s and Smocks’ Birkenstock chef shoes are also easy care and can be run through a dishwasher (up to 149 degrees) at the end of a day. And we make it easy for you to order—assisting with sizes conversion from the European sizes, keeping our stock supplied so that orders ship quickly, and giving free shipping on all shoe orders. Contact us for assistance on your shoe order.